While Australia’s on the verge of autumn/winter (not there just yet), Europe’s just about to see the sun again after a long, cold winter. So if you’re ever finding yourself without a spark of inspiration for some chic winter style outfits, there’s no better way to find some than having a look at Europe’s main fashion cities. There’s plenty of casual chic street fashion to copy & make your own to last you all through winter. Of course, each city has got its own style and vibe (think Copenhagen & Milan, very different cities with very different styles) but that makes it all even better as you’ve got plenty of options to choose from. While you’re checking out influencers’ styles to copy, keep the list of 2019 winter trends in mind. Quick recap: prints, supersized coats, utilitarian, soft cut suits, neutral tones, massive dresses, clashing textures & corduroy. Spain mostly doesn’t get too cold in winter which leaves room to wear your autumn wear throughout the season continually. All you need is to throw a supersized coat on for the colder days and you can wear your autumn wardrobe, sans shame. Supersized check-printed coat, pair of knee high boots, leather satchel, leather gloves and a baker boy hat. In comparison to Barcelona, London gets very very very cold. It’s no surprise massive dresses are spotted on a lot of fashion lovers. 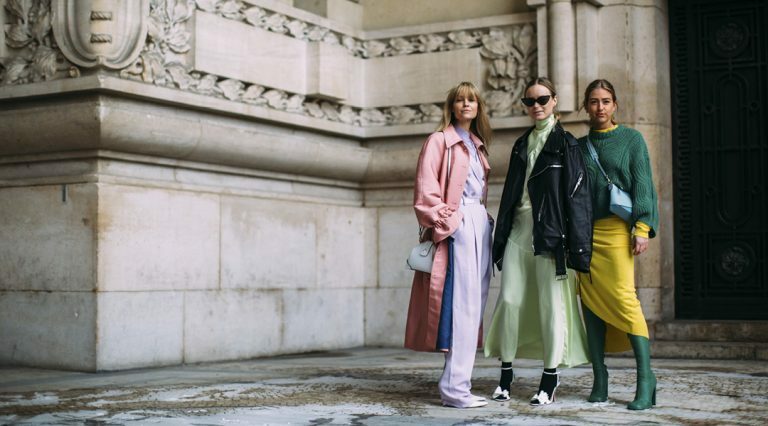 Google “london street style winter 2019” and you’ll see a gallery of massive dresses everywhere. Black maxi dress, belt, hat and bucket bag, knee high suede boots. There’s much you can say of Paris, but one thing you can’t say is that there isn’t inspiration in any corner you look. Because even when it’s not necessarily your thing, you can take the basics of the look and make it your own. Neutrals, stripes, cropped hair. If that’s not Paris in three words, I wouldn’t know what is. Neutral coloured soft cut suit blazer, basic top and midi skirt, pair of loafers. One really fun trend of this winter is the mixing and clashing of materials. Where in the past it’d be all about monochrome - one material all over, this year’s different. Grab a suede, grab a chiffon, a linen, go nuts and mix all the materials you have in your wardrobe. This season, corduroy is making a huge come back so focus on this material as your key winter style item. Corduroy shirt or blazer, cotton pants, suede shoes and handbag, silver bracelets. Baby blues are one of this year's focus colours (especially during the latter part of winter turning into spring you’ll notice a lot of blues everywhere) so invest in this wardrobe essential. Whether that's a suit, pair of pants, shirt, bag, shoe - go for it. Baby blues, sunglasses, white sneakers. When copying influencers looks always be aware that you make it your own - authenticity is everything. If your winter style doesn’t match you, what is it worth? Show us your winter looks on Instagram and don’t forget to tag us @fashiola_ for a chance to get featured.